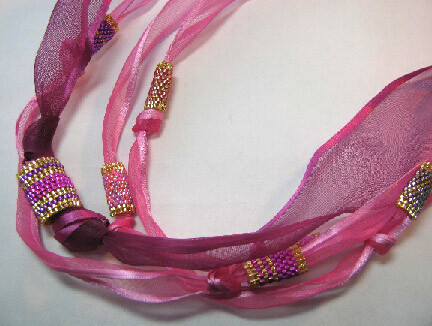 Beading Arts: Spring ribbon necklace! I'm tired of winter colors...I want spring, and I want it NOW! Since I live in New England and can't always have what I want, the next best thing is to make spring jewelry. I asked for a couple of fabulous wire edged ribbons from Offray Ribbons in beautiful springy colors: wild berry and violet. The wires give you a bit more structure, which I thought would pair perfectly with some beaded beads! 1. 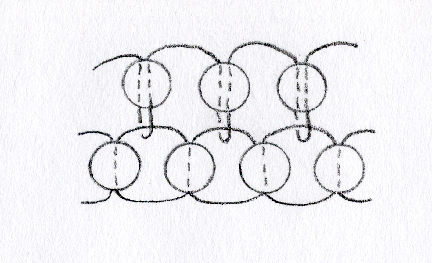 Use ladder stitch to make two rows of 12 beads (thread pattern shown below). 2. Slip them around a crochet hook (I used size H), and connect the ends. 3. 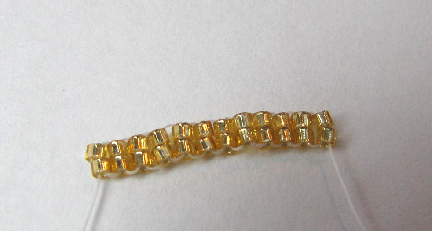 The beaded beads will be constructed with brick stitch on top of the ladder stitch (thread pattern shown above). 4. 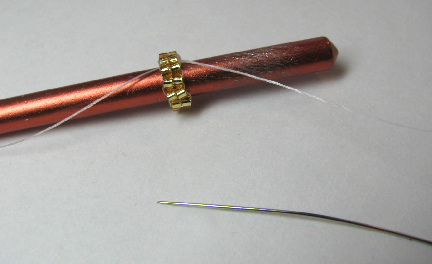 For the first stitch, add two beads. 5. 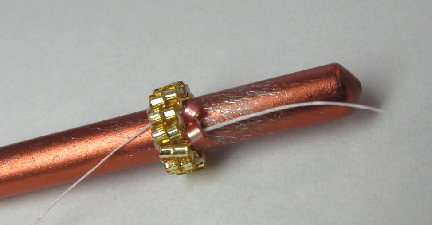 For each additional stitch, add just one bead. 6. Stitch 10 rows of brick stitch, and finish off the top with a row of double brick stitch, where you will add two beads at a time instead of just one (for the first stitch in this row, you will add 4 beads). Stitch the working end of the thread back down through the bead to exit at or near the tail end. Cut the working thread, and stitch the tail end through several rows before cutting. 7. 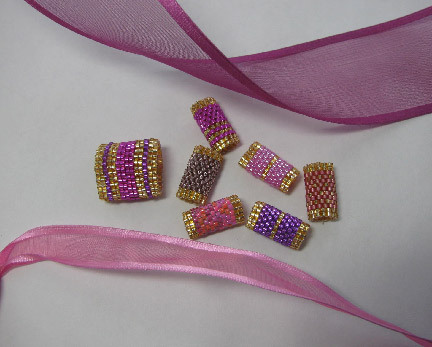 When you have as many beads finished as you want, cut your ribbon. I cut 3 strands as follows: 24" violet ribbon, 26" violet ribbon, 28" wild berry ribbon. 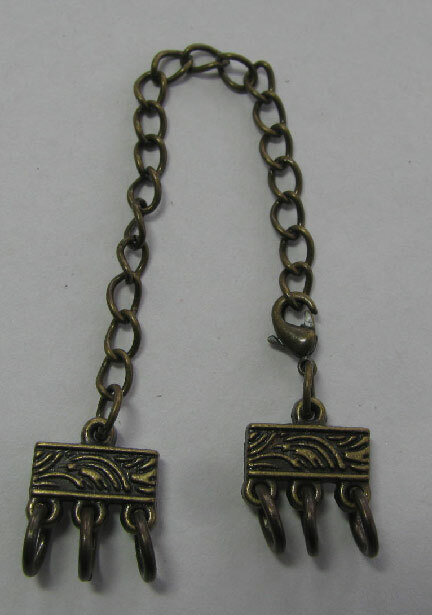 The larger bead shown above is 24 beads around instead of 12. 8. 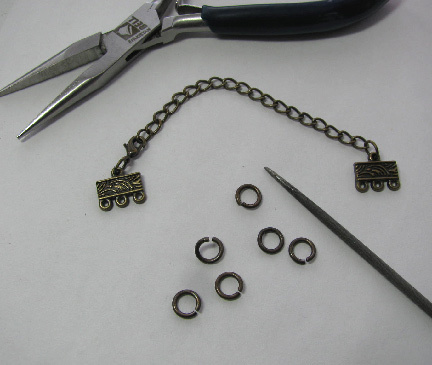 Lay out your multi-strand clasp set and jump rings. I needed to ream out the holes for the jump rings a bit, using a rat tail file. 9. Slip the jump rings through the holes and close them up. 10. 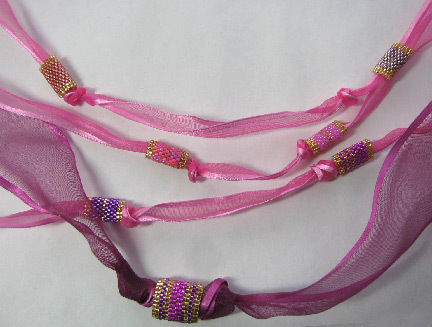 String the beaded beads onto your ribbons, and tie loose knots on either side of each one. 11. 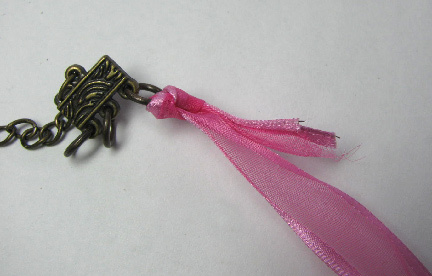 Slip each ribbon through a jump ring and knot it, one at a time, with the shortest ribbon on the inside edge. 12. 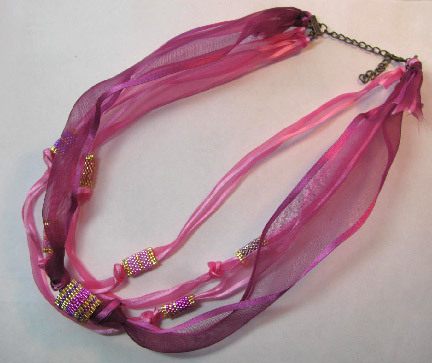 A simple design that will let your beads and ribbons both shine! The necklace is lovely and the beads are awesome! Thanks so much for the detailed instructions, Cyndi.